Last edited by Geecko123; 04-08-2019 at 11:49 AM. Your boy is very wonderful, what great pics! Sounds like he is living a pampered and happy life. I just recently got a leopard gecko a few weeks ago, she's a red stripe and is approximately seven months old. 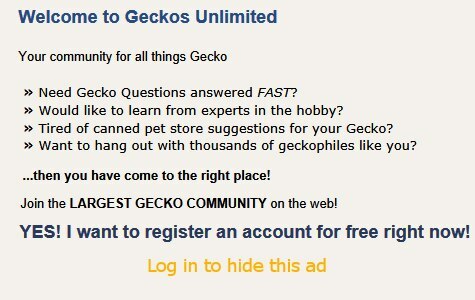 I posted a picture a few moments ago in the thread on this particular forum called "New gecko, new skin." And I have a photo of her enclosure in a thread on husbandry called "Preparing for first leo," but no real good pictures besides those. My as of yet unnamed girl seems to be settling in well. She seems curious, and much of the time she sleeps outside her caves, and I love seeing her relax and pancake out. It makes me think she feels comfortable in her new home. She's a great huntress; I drop in one mealworm at a time and she stalks them with vigor. She'd probably eat 20 in a day if I let her, she's very ravenous. My girl also likes to be handled, like your fella, which is so much fun for me. I've never had a lizard so it's really great to have her climbing all over me and letting her explore my bed. Here's to many years of fun with our reptilian buddies! I love your gecko, and I love learning about her, she sounds like she is happy and healthy in her new home. That weekend I went in again, and looked to see if he had been removed37BC9B76-AA44-47D8-90CA-E3A19C6BA51F.jpg. Nope. I decided to adopt him. When I took him home, I expected a scared, stressed gecko that would want nothing to do with me. I was so wrong! He loves sleeping on my hand and crawling up my arm. He is so curious about any and everything about him. He just melts my heart whenever he looks up at me. I name him Echo because that is what my little sister calls geckos lol. Last edited by EchoTheLeopardGecko; 04-15-2019 at 08:45 PM. I have two geckos myself and I care for two more (my siblings) and oh boy do they all have interesting personalities. The youngest is between 5 and 7 months old, and he’s easily the most vicious hunter. He’ll chase down a cricket from the other side of his tank lol. He is the only one who constantly wiggles his tail. His name is Angel and he’s my baby sister’s. He is the only one who consistently uses a red light cause his uth doesn’t provide much heat at night and we’re still trying to fix it. I think the second youngest is my girl Firefly who is an alpha female if I’ve ever seen one. I can’t even have her on the bed with another gecko or she’ll wave her tail at them. Heck, half the time I walk into my room she’ll wave her tail at me. Unless she sees I have food. Then she comes straight up to the glass, eats her fill, and then proceeds to wave her tail at me when she’s done. I think the second oldest is my middle sister’s female named Luna. She does a lot of lounging around, and she always is tense when my sister (her owner) comes in the room but loves me. Probably because I’m home more often and feed her. And don’t put her on a leash. (Yes I’ve told my sister it’s not a good idea and no she hasn’t listened and my parents don’t want to cause an argument). I think the oldest is my male gecko named Illusion. He is the sweetest thing. Like. He sees me come into my room and he runs out of his cave to greet me. He is the best with hand feeding, always super gentle. Except one time where he grabbed my finger and the worm and tore my finger up. They have some really sharp teeth. I adopted him at petco (Not bought- they had leos for adoption there and I went to grab more crickets and fell in love with him) and I think he was housed with another male- he’s missing all the toes on his front left foot and the last three rings on his tail had been bitten off. Luckily he’s recovered just fine and is enjoying having his own 20l gal. thanks so much! I love learning about one anothers geckos, I found my leo loves to have his backed rubbed also. There's still so much to learn about leopard geckos, I'm still learning about his personality even after 5 months. I don't have any leos. I have 3 geckos and one anole. TAD (Tiny Ancient Dinosaur): My first, he is about 9 years old now, I got him two years ago. He comes out at night, is very curious then, and active. Doesn't really like being handled, but tolerates it pretty well. I don't handle him a lot, and just let him be a gecko. He's fun to watch after the lights go out. Hygge ("content with life") - my gargoyle gecko. I hardly ever see him. He hides like 99% of the time. Hates being handled. So he is pretty much a display animal in hiding, lol. OhGee (Office Gecko) - a Bauer's chameleon gecko (e. agricolae). I keep him in a 12x12x12 tank on my desk at work. He's always out in the open and is a very slow mover (unless I'm trying to catch him! ); he spends almost 100% of his time on his favorite vine. I love having him at work with me. My little "jungle at my desk." He cracks me up when he sleeps upside down. He is about 1-1/2 years old, I've had him about a year. TBD (Tiny Badass Dragon): My Cuban False Chameleon, or Western Bearded Anole. By far my favorite as he is my most active, doesn't mind being handled, and actively looks for me and his food in the evenings. He loves climbing all over his tank, especially on the rope ladders I made for him. He is almost a year old, I've had him for 10 months. Last edited by GeckoLeen; Today at 08:58 AM.